"It's beginning to look a lot like Easter..."
Unlike Christmas, Easter is one of those days that changes from year to year. In 2015 Easter falls on the first weekend in April, with Easter Sunday being April 5th. 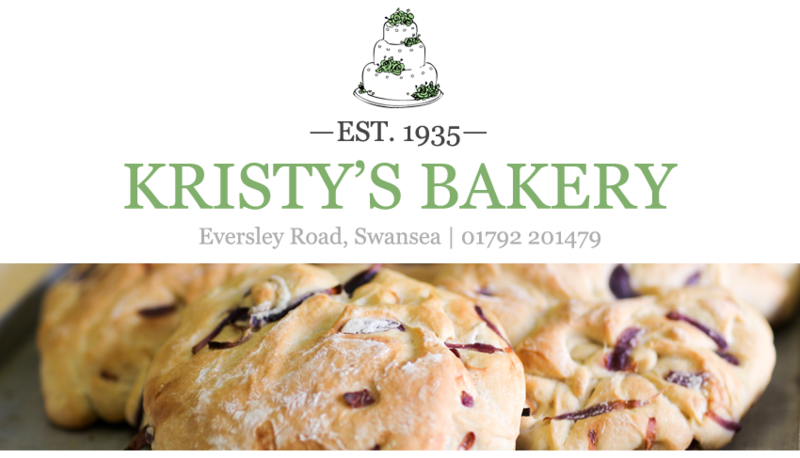 At Kristy's Bakery we've been supplying Swansea with an array of high quality Easter treats for decades, from handmade Easter eggs and hot cross buns, to traditional Italian celebratory cakes that you'd struggle to find anywhere else. In particular Antonio makes an authentic Italian Easter bun called Colomba Pasquale (translating to Easter Dove in English) - a light but rich bun, delicately flavoured with orange peel and dressed with toasted almonds. If you like panettone at Christmas time, you'll love it! We also make a very popular Simnel cake - a decadent and spicy fruit cake with marzipan baked into it, with additional marzipan balls on top, giving the cake its instantly recognisable look. The Simnel cake is in limited supply, so if you're in Swansea, pop into the bakery soon to avoid disappointment! We also make many other Easter treats, including milk, white and marbled chocolate eggs, Easter biscuits (plain and fruit), marzipan chicks and rabbits, and - of course - plump hot-cross buns. 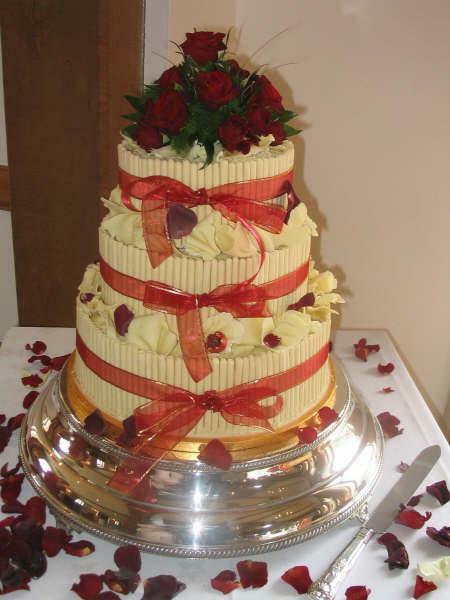 If you want to order anything you've seen here, just pop into the bakery, on Eversley Road, Sketty, or give us a call on 01792 201479. Remember to like us on Facebook for more updates. 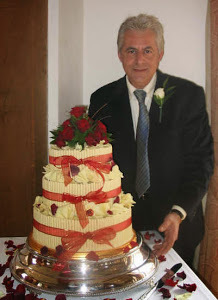 The bakery's owner Antonio has worked in all areas of the hospitality trade, from waiter to chef to baker (obviously! ), from Italy to Swansea to Canada. As a chef he worked in several restaurants across the county, cooking authentic Italian food for hungry customers. His last chef's position was in the famous San Carlo restaurant in Birmingham in the mid-nineties. 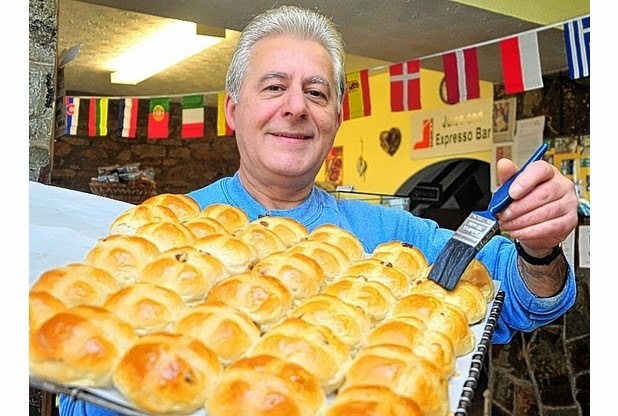 After returning to Swansea and taking over the bakery in 1995 he turned his attention to breads and cakes. However a few years ago he decided to introduce a couple of his traditional Italian sauces into the bakery and they became very popular. A batch of Messinese Sauce being prepared. Based on family recipes, every few weeks Antonio makes a small batch of his sauces, using fresh ingredients. 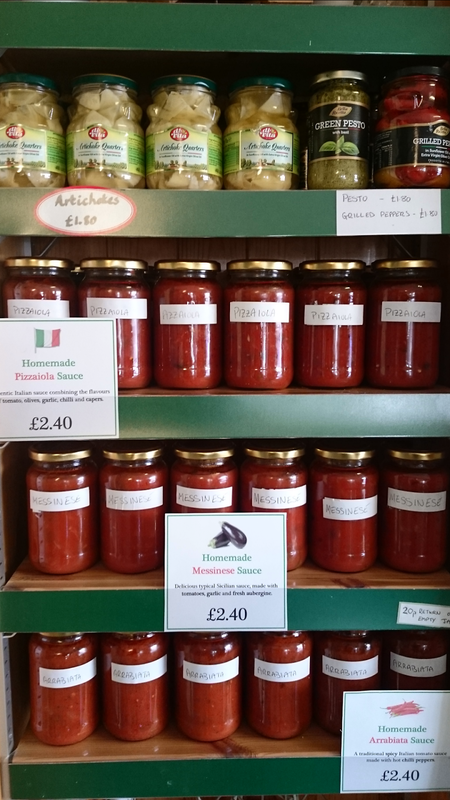 He then jars them up and sells them in the shop, which our customers enjoy using on pasta, meat and in vegetable dishes. At the moment there are three varieties on sale. First we have our home made Pizzaiola - an authentic Italian sauce combining the flavours of tomato, olives, garlic, chilli and capers. This was our first sauce and is probably the most popular. We then have our spicy Arrabiata, which is a classic Italian tomato sauce with a good kick as it's made with fresh, hot chilli peppers. And finally there's our home made Messinese - a delicious typical Sicilian sauce, made with tomatoes, garlic and fresh aubergine. The jars are always on sale in the shop, although not every variety is available every week. Also Antonio sometimes makes a few different 'limited edition' varieties, so it's worth following us on Twitter or Facebook as we'll announce them on there. And remember if you bring back your empty sauce jar for recycling, you'll get a 20p refund. You can order a jar of sauce by calling 01792 201479 or popping into the bakery on Eversley Road, Sketty. It's March and... it's raining in Swansea (of course). So cheer yourself up with a true taste of sunshine! 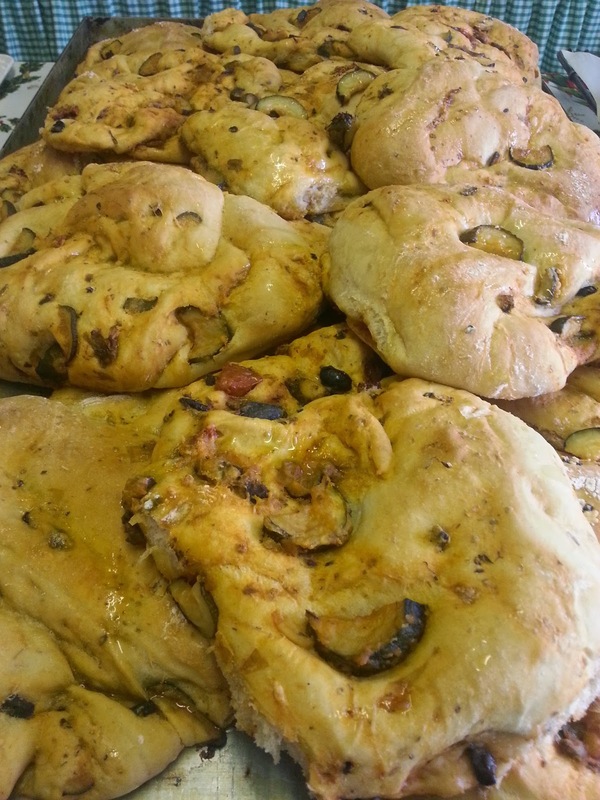 Even if you are stuck in Swansea, the bakery is where you want to be heading for a real taste of Southern Italy: our traditional Pilla bread. 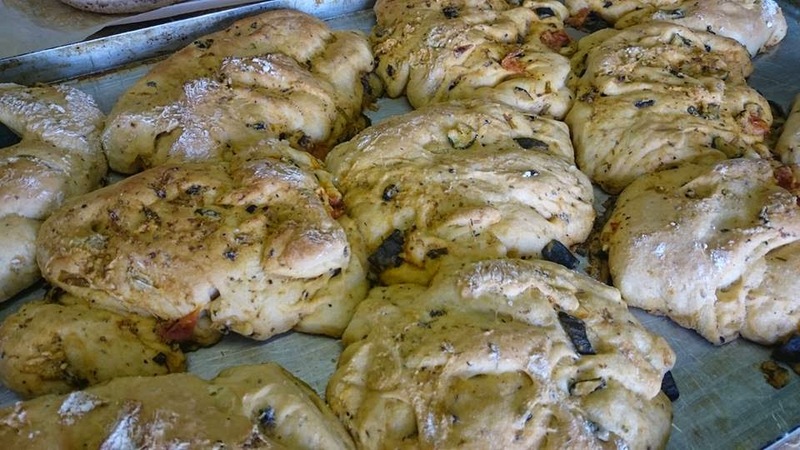 The tasty bread is made using a mixture of fresh vegetables and spices, including spring onions, cherry tomatoes, courgettes, black olives, capers and - of course - hot chili peppers! ...then fried together to create the delicious mix. The mix is added to the dough, then baked in the oven and generously drizzled with extra virgin olive oil. The result is a delicious, fluffy bread with a very good kick. It's hearty enough to use on it's own as a lunch-time meal, or on the side of a pasta dish to mop up the sauce. The Pilla also makes a great bread for sandwiches (use an Emmental cheese or some fresh cherry tomatoes as a filling). At Kristy's Bakery, Swansea, we make the Pilla bread every few weeks, although we may be able to make some to order if you are desperate. Just give us a call on 01792 201479 and we can tell you when it's next coming out of the oven!